I'm a huge fan of German Pilseners. This is one style that I simply have to brew it the way I want it. The ABV of this brew will exceed the style limits for sure and I'm pretty sure I'll hit the upper limits or higher in IBUs. Cause that's the way, uh huh uh huh, I like it! The great part about brewing a pilsener is its simplicity. German Pilsner malt and some noble hops is all it takes. Despite the basic ingredients, there's lots of variety out there. Some pilsners are light and sweet while others can be very dry and hoppy. Some great pilsners I've had are Bitburger, Warsteiner, and Spaten Pils. In the recent spirit of doing "research", I picked up a couple of new pilsners to try. 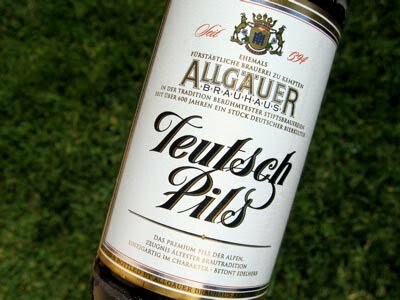 The first is from Allgäuer Brauhaus, their Teutsch Pils. Allgäuer Brauhaus is in Southern Germany and so it was expected to be small in the hop department (Pilsners, I've read, tend to get drier and hoppier to the north). 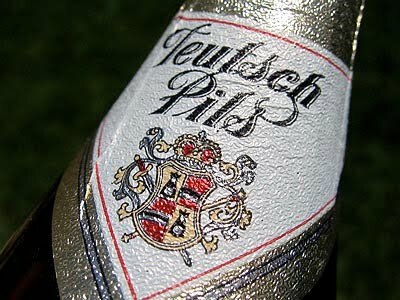 I forgot to take a snapshot of the poured beers this round but the Teutsch Pils was golden pale in color with little head retention. It was more malty than dry and had a light yet balanced hop bitterness and flavor. Allgäuer Brauhaus Teutsch Pils from Southern Germany. I'm digging on these German bottle neck labels! 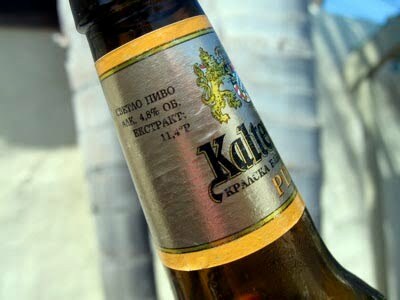 The other pils I picked up was brewed by König Ludwig in Bulgaria. 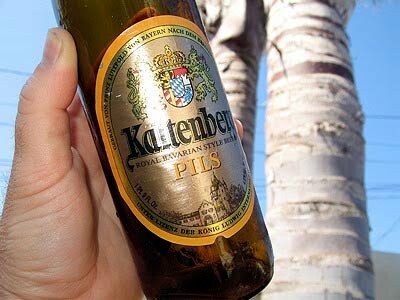 Their Kaltenberg Pils was much more of a Bavarian Pilsener style with a sweeter malt flavor and bigger body. Hop bittering seemed very low and only subtle in the aroma and flavor. Tasting these more uncommon bottles makes me wonder how fresh these beers truly are. I couldn't find this particular label on the König Ludwig's website so this must be adapted or relabeled for export. It might be time to consider a beer-cation to drink these European gems at their source. König Ludwig's Kaltenberg Pils from Bulgaria. König Ludwig uses more of a standard neck label. 0.65 oz. Magnum 60 min. 0.5 oz. Saaz 30 min. 0.35 oz. Tettnanger 10 min. 0.25 oz. Saaz 1 min. Update 8/26: Racked to secondary. Current gravity is 1.013 @ 75°F (diacetyl rest). It will be a couple of weeks until I start lagering. Evaluation: I took this beer to QUAFF's evaluation panel on November 17th. I poured this towards the end of the evening so the panel was a bit spent. While the malt profile was there, it was the hops that needed to go bigger. I don't think I mentioned gravities and the ABV because those are a tad high as well. A word of caution was discussed about using Magnum for bittering since its easy to overdo the bittering. We also talked about loading more noble hops at the end of the hopping schedule.